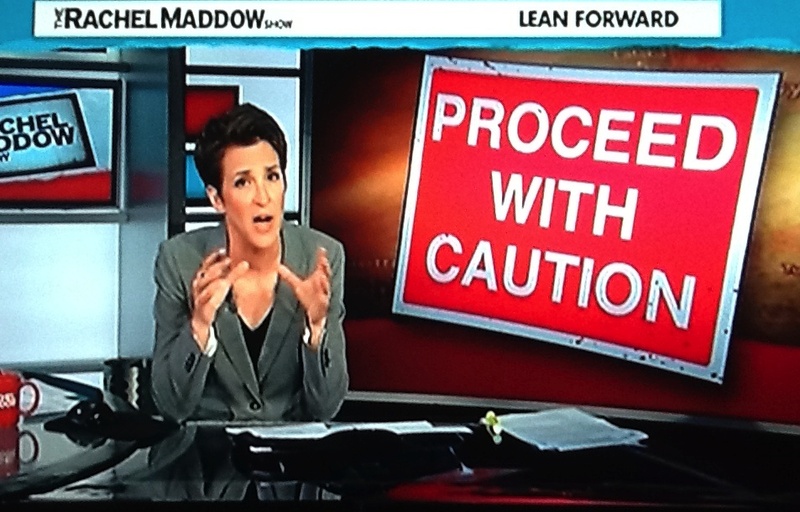 During her August 21 broadcast, in a segment on the reported use of chemical weapons in a horrific attack that killed hundreds of civilians in Syria, MSNBC host Rachel Maddow discussed the possible implications of such an horrendous act and touched upon past uses of potentially similar substances such as Sarin and mustard gas. She spoke about Saddam Hussein's use of these chemical weapons against Iranian soldiers and civilians during the Iran-Iraq War and in the massacre of thousands of Iraqi Kurds in Halabja on March 16, 1988. Maddow did not deem it necessary, however, to tell her audience about the United States government's role in actively supporting the Iraqi military at the time and perhaps even providing Saddam with the very chemical weapons he then used to slaughter countless human beings. Furthermore, Maddow noted that, following the Gulf War, the international Chemical Weapons Convention (CWC) was established in 1993 and that only "a handful of countries refused to sign onto that convention: Angola, North Korea, Egypt, South Sudan, Somalia and Syria." Her list of these six nations was accompanied by an onscreen graphic. But it wasn't quite right. In fact, only five states - Angola, North Korea, Egypt, South Sudan and Syria - have never signed nor implemented the Chemical Weapons Convention. While Somalia did not sign the treaty before it came into force, the country is now, as of June 28, 2013, a member of the convention through the process of "accession," which the United Nations defines as "the act whereby a state accepts the offer or the opportunity to become a party to a treaty already negotiated and signed by other states" and which "has the same legal effect as ratification." Somalia is not alone in having acceded to the CWC. Other states like Serbia, Jordan, Libya, Lebanon, Belize, Botswana, Sudan and Iraq have all voluntarily adopted its protocols without being original signatories to the convention. Missing from Maddow's commentary on the CWC, however, was any mention of the only two states on the planet that have signed the convention yet never ratified it, thereby reneging on their original promise to abide by its rules. These two nations are Myanmar and Israel. 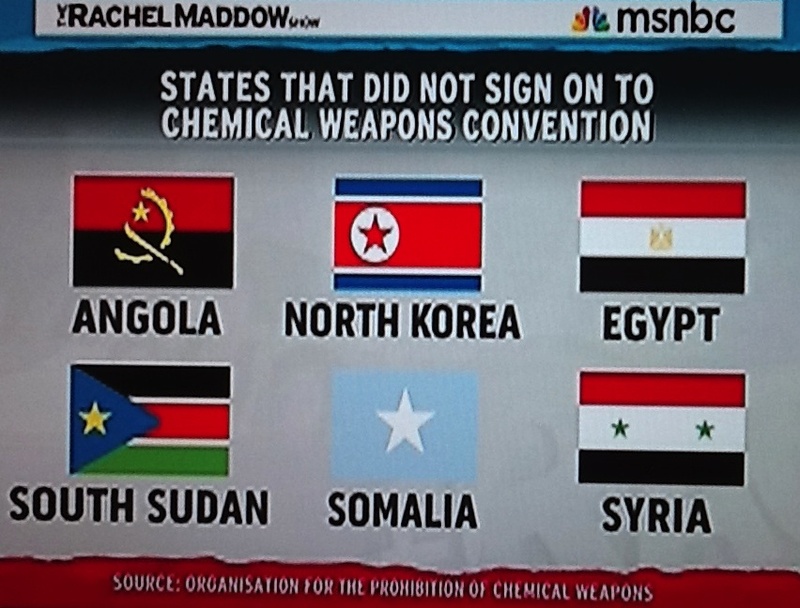 They join the five countries (not including Somalia) mentioned by Maddow in explicitly refusing to adhere to the ban on using chemical weapons. Israel has a history with Sarin gas and has routinely used chemical weaponry such as white phosphorus in densely populated areas, an act regarding as potentially a war crime. Despite ongoing claims that it would "stop using artillery shells with white phosphorus to create smokescreens on the battlefield" and that shells containing white phosphorus would be "removed from active duty soon," in early July of this year, Israel's High Court of Justice actually "dismissed a petition calling for a ban on the Israeli military’s use of white phosphorus munitions in populated areas." Furthermore, Israel is one of only 16 states to never sign nor ratify the Biological Weapons Convention and the only state among those with substantial military might and believed to have actually developed an offensive biological warfare capability. An August 1993 report by the U.S. Congress Office of Technology Assessment identified Israel as a country possessing a long-term, undeclared, offensive biological warfare program. In 1998, Bill Richardson, a Deputy Assistant Secretary of Defense for Nuclear, Chemical and Biological Defense Programs in both the Reagan and George H.W. Bush administrations, declared, "I have no doubt that Israel has worked on both chemical and biological offensive things for a long time," adding, "I don't think you'll find much on it. We've always seemed to have a double standard on Israel, compared to talking about the threats from other countries. There's no doubt they've had stuff for years, but getting anybody to say anything publicly about it is going to be pretty hard." Louis Toscano, a former UPI Jerusalem bureau chief and author of "Triple Cross," a 1990 book about Israel's clandestine nuclear arsenal, revealed, "I've never had much doubt that they were producing a limited arsenal of chemical weapons. In fact, it was widely rumored that a chemical factory was operating under the guise of a university research center around Haifa." Moreover, Toscano said, "What makes it all the more dangerous is that they, unlike Saddam or any of the other Middle East bogeymen, have developed weapons systems capable of delivering such weapons." Perhaps Maddow should have pointed that out. thank you for your efforts to inform. I am curious if you have contacted Chris Matthews and Rachel Maddow to inform them as well. I certainly think you should!